Our students and classrooms are in crisis right now. Room clears. Students experiencing trauma. Lack of support. Stress management. Unmet student needs. Disrupted learning. Behavioral issues. Large class sizes. Housing instability. Decades of under-funding have brought our schools to the boiling point. From Vale to Vernonia and Pendleton to Phoenix, educators and students alike are dealing with this issue of disrupted learning. Without adequate staffing levels, support staff, wrap-around services, and resources to execute restorative justice programs, our students are suffering. Educators are experiencing increasingly frequent and severe behavioral outbursts in their classrooms and schools, in all grade levels and school buildings. These behaviors impact both students and educators. Without adequate supports, educators’ ability to solve and prevent outbursts is limited, and it is incredibly difficult to meet the needs of those students who are acting out. 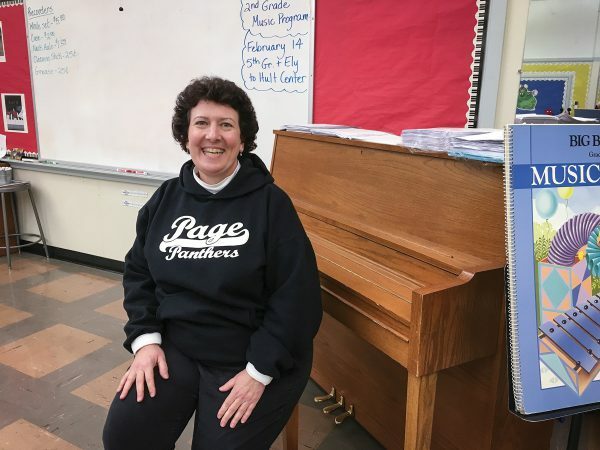 Laurel Ross, a music specialist in Springfield, shared last year: “[A huge] impact of budget cuts is the elimination of self-contained classrooms in districts. Districts no longer have the resources to support programs for students with significant behavior issues. Originally, we were told by the school district there would be classroom support and trainings for instructional assistants. Very little of that has happened due to budget constraints. In some classes, significant instructional time is lost due to outbursts, de-escalation plans, keeping everyone safe, and getting help for the students involved. Laurel Ross, music specialist in Springfield, OR. Brenda Roland, a first grade teacher in Oregon City, shared her story with the legislature last year: “Increasing numbers of students experiencing poverty combined with large class sizes sets up the perfect storm. Large class sizes impact my ability to educate and support students living through trauma. In my class right now, trauma means not having enough food at home, homelessness, not knowing where they’ll be sleeping each night, grieving the death of a parent or any variety of abuses/neglect. Students share their plight verbally and through their actions, unable to gain control of the situation – they’re first graders. Each year, the number of students affected by trauma increases. Our counselors are not full time and as my class size increases, my ability to provide individual attention decreases. The classroom isn’t exclusively about academics anymore; it’s about meeting each child’s social and emotional needs. I should be focused on strategies to teach reading and math, how to be a good communicator, and work effectively in groups to problem solve. But until each students’ primary needs are met, rigorous learning can’t be a priority for students with trauma. They can’t access academics and that causes behavioral issues to escalate. Kids experiencing trauma can’t self-regulate. When their needs are not met immediately, screaming, running, chair throwing or single sweep table-top clearing happens. Kids just don’t know what to do with the emotions that trauma produces. Horrifically, it’s a chain reaction. Already, OEA has been working hard to raise the profile of this issue. We’ve met with the Oregon Department of Education, the Chief Education Office, the Governor’s Office, and the State Board of Education. On Feb. 5, we hosted a lobby day for members across the state to talk to legislators about their own experiences. Throughout the session, we’ll be sharing one story a day with legislators, demonstrating the impact under-funding has on our students and our schools. Your union will be focused on this broad, complex issue over the next several years, but we need your help. Share your story! This issue is wide-ranging and complex, encompassing many different problems with varying solutions. We need to hear from you and what’s going on in your day-to-day work. Go to: www.oregoned.org/storyproject for more information. We’ll share these stories with legislators in Salem as well as with other OEA members. Stay tuned for a townhall event near you on this issue in the springtime and next school year!